Perpetual Porcelain // Perpetual Porcelain is a new kind of porcelain that is created by approaching the porcelain production process as a circular process, instead of a linear process. Perpetual Porcelain uses a method that, within the different stages of the porcelain production process, reinstates the resulting waste in the same production chain. In every waste stream, values re hidden that are revealed on the basis of four designs. The four designs therefore have special, characteristic properties such as a subtle sheen, a grain structure, or a shade of color that has arisen from the porcelain waste processing. Instead of recycling the waste outside the production chain, the different characteristics of the waste are valued and used as a design tool within the same chain. With this material and the associated circular method, I can not only make my own production more sustainable, but also look at how other production houses or factories can benefit from the same method. 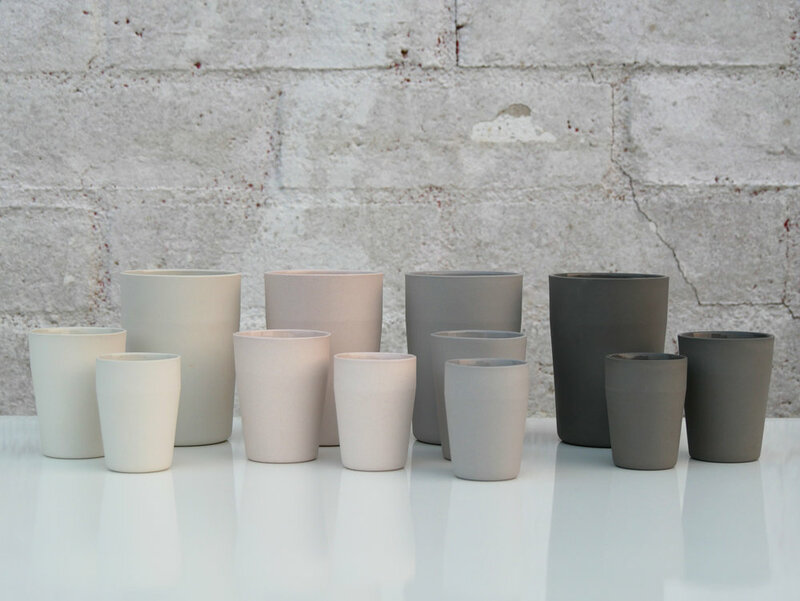 Perpetual Porcelain aims to eventually bring about a change within the porcelain industry at large. Studio Lotte Douwes // Lotte Douwes is a designer based in Rotterdam in the Netherlands. Her designs are characterized by simple solutions that approach the world around us from a different perspective. The studio is mainly focussed ceramics, research and development of interior products and materials.Lotte is driven by a passion to create and connect and sees a huge value in sharing thoughts, knowledge, networks and ideas with others, which is visible in both her personal and professional life. In the past year Lotte made the decision to take her studio to another level and start focusing on sustainability and impact, instead of merely focusing on products. She is very happy that due to this transition, the studio established meaningful connections with and beyond the porcelain industry that is willing to make a change for the better (in terms of sustainability). At the moment, Lotte is collaborating with partners to create porcelain tableware / products with a circular production method and is looking forward to making more fruitful and meaningful connections to change the porcelain industry from within.